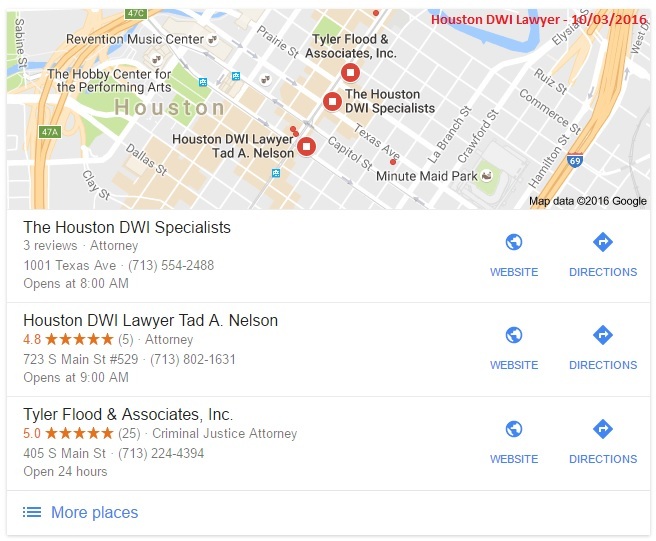 The Houston DWI lawyer market is a funny one. Houston is surprisingly competitive. DWI is not my niche of choice but I do pay occassional attention to it as some of the personal injury law firms that I work with represent those who lost their license while driving while intoxicated. As a content creator, I only have so many ideas when it comes to DWI. I mean, if you have a DWI, you have a DWI. If you were injured, you could have one of a million questions, such as “can I sue my neighbor?”, “What if I get hurt on a METRO bus in Houston?”, “What if the idiot who hit me had no insurance?”, “What if they were drunk and have a DWI lawyer?”. Ok, back to the topic at hand: Who is on the front page of the Space City, and how did they get there? The Martinez Law Firm Martinez has a nice looking WordPress website. Additionally, Martinez is a former judge and chief prosecutor. Johnson, Johnson & Baer PC They have a WordPress site as well. I should probably note that WordPress is very SEO friendly. Simply using WordPress won’t help you outrank the competition but it is at least the foundation. AVVO This site is everywhere, even in the world of bankruptcy lawyers. It is because all you lawyers keep linking to it. I would expect it to remain in the top 10 of every major search term for quite some time. Tyler Flood & Associates, Inc. I like this WordPress site. It isn’t the flashiest in the world and it doesn’t need to be. There is a lot of content on this site. I like it. Trichter & Murphy, PC Finally, an attorney with some facial hair. And a hat, too! If I ever get busted driving around Texas with a dozen beers in my belly I am calling these guys! Seriously! Although, that could be a long wait since I do not drive after drinking and I have never been to Texas. They also cover DWI pilots! I love the huge FAQ page. And, yes, this is WordPress. At the moment, this site shows twice on the front page. This happens often with attorney websites. Google will usually “correct” this at some point but they could enjoy this for a good 90 days. Tad Nelson & Associates. Wow, a .GURU domain ranking in the top 10. This is not something I have seen very often at all. What an interesting surprise. This site has loads of good content and a blog as well. Justia. Heh, same as AVVO above. The Law Office of Matt DeLuca. WordPress again! Wow, that was 8 out of 8. Nice. In a competitive niche there is almost no other option at this point, at least if you are starting from scratch. One site that caught my eye in many long tail search results was the Madrid Law Firm. Their Houston DWI offense page is huge. They have an active blog as well. The content here is very informative and written well for anyone who has just been arrested. Links can be good, bad or ugly. Below are some links the top ranking attorneys have. Now keep in mind some of these links could actually be impacting the attorneys negatively. Links from press release sites and directories are usually worthless. In September 2016 there was a big shakeup. Google Penguin 4.0 has been rolling out and some sites which were ranking poorly due to an algorithmic penalty are coming back to life. Additionally, Google Possum is out now and shaking up local results. Previously, Houston local results (map results) correlated strongly with organic rankings. Now the results are all over the place in many cities. In Houston, though, we have Martinez, then Tad Nelson, then Tyler Flood. So the local rankings, in this case, are still very closely paired with organic rankings. For now. Most SEO companies have absolutely no idea or no drive to rank an attorney. They sign you up and forget about you. We are quite the opposite here. I have a team of content writers available as well if you need legal content in addition to SEO. As stated above, DUI is not my main niche but I have worked in niches significantly more competitive. If you have a question, please reach out. If I can’t help you I will be happy to point you in the right direction or offer consultation.